WASHINGTON (CNS) — Builders, church leaders, choir members and journalists gathered atop eight floors of scaffolding — 159 feet high — in the Basilica of the National Shrine of the Immaculate Conception on Oct. 28, 2016 for the blessing of the workspace where a new mosaic will be installed on the shrine’s Trinity Dome. WASHINGTON — Monsignor Walter Rossi, Rector of the National Shrine, and others, discuss the basilica’s 96-year history and the structural challenges that the mosaic completion of the Trinity Dome presents. A project that is a Century in the Making will be completed in late 2017 in time for the centennial celebration of the laying the foundational stone in 1920. 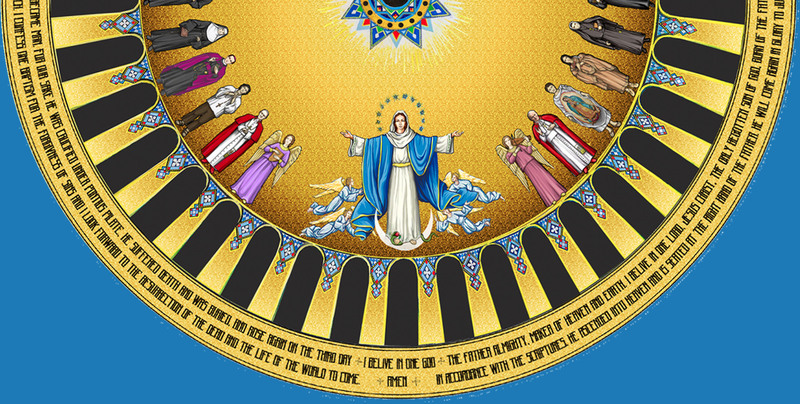 The final mosaic, consisting of over 14 million pieces of venetian glass, is considered be the “crowning jewel” of what is known as America’s Catholic Church. WASHINGTON – Finishing touches to the largest dome the National Shrine are underway – but not before a blessing from Cardinal Donald Wuerl. Work on the Trinity Dome at the Basilica of the National Shrine of the Immaculate Conception is the final project needed to complete the work which began almost 100 years ago. Crews have constructed elevated scaffolding that reaches 16 stories above the nave of the Great Upper Church of the Basilica. Work on the great dome is expected to be completed ahead of the 2020 celebration of the 100th anniversary of the laying of the National Shrine’s foundation stone.